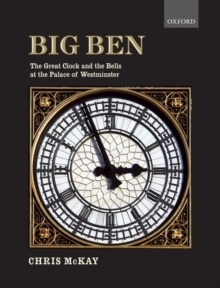 This book covers the history of 'Big Ben', the great clock and bells at Westminster, from the origins of Westminster as the seat of government right up to the celebrations of the Great Clock's 150th anniversary in 2009. The book begins by taking the reader through a typical visit to the Clock Tower, and then begins the history of the palace of Westminster, covering the fire of 1834, the building of the New Houses of Parliament and development of the clock and the bells, going into detail on their design and installation. The book covers the famous cracking of the current bell Big Ben in 1859, with sketches of all the characters involved, the two world wars, and the disaster of 1976. The book ends with adetailed technical description of the clock mechanism. The book is richly illustrated, and will appeal not only to clockmakers and horologists, but to bell enthusiasts, and those with an interest in our rich Victorian heritage.